You may want to file Inchoate in the 'strange, but arrestingly different' category. On his fourth Inchoate adventure, composer Brandon Duncan invites us to an 'instrumental metal soundtrack to a fictional zombie movie' with his genre-crossing riff-based composition. Zombies being somewhat detached from reality and inchoate themselves, Duncan's music is abundantly metaphorical. 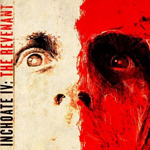 'The Revenant' appears discordant and cacophonous as Inchoate's chords and riffing venture through thrash, doom and industrial metal to create its ambience. Yet, it's this very sincere and adventuresome riff development that makes this work cohesive. Don't look for fancy fret work here; I don't think Duncan could pull off a guitar solo for the sake of his mother's life. In the end, what is foundational to Inchoate's success is also it's greatest weakness. Kick out the crutch of meticulous and creative riffing and you have 30 plus minutes of what most every modern metal band seems to be doing. Yet, Inchoate's 'The Revenant' is oddly compelling, if not an acquired taste. In the end, what is foundational to Inchoate's success is also it's greatest weakness. Kick out the crutch of meticulous and creative riffing and you have 30 plus minutes of what most every modern metal band seems to be doing. Yet, Inchoate's 'The Revenant' is oddly compelling, if not an acquired taste.